What is the Blackjack Hall of Fame? How famous is the Blackjack Hall of Fame? While every professional player probably knows about it, many recreational blackjack players could miss out on its very existence. If this is the first time you have ever heard about this prestigious honour for blackjack professionals, read on to learn more about it. Who knows, maybe it will motivate you to improve your own blackjack skills! Although blackjack is an old casino game, the Blackjack Hall of Fame was established only about a decade ago – in winter of 2002/2003. In the initial year, 7 blackjack experts and professionals were inducted in the Hall of Fame after they were chosen by a public vote. The initial inductees were: Al Francesco, Peter Griffin, Edward O. Thorp, Ken Uston, Arnold Snyder, Stanford Wong and Tommy Wyland. All of them have one thing in common – they left a lasting mark in the blackjack field. The following years saw the inclusion of more blackjack experts, usually inducting 2, and then 1 player per year. It was also established that the existing members of the Blackjack Hall of Fame are obliged to make yearly nominations, with the final selection itself taking place at the annual Blackjack Ball. 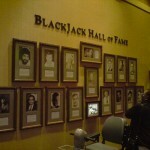 The Blackjack Hall of Fame is more than just a prestigious list. Its physical location can be found exclusively at Barona Resort & Casino in San Diego, California. Apart from honouring the inducted blackjack players, the Hall of Fame also contains an interesting display of ancient cheating devices. Finally, here is an interesting detail: Barona Casino awards all members of the Hall of Fame a special privilege: they get a lifetime room, food, and beverage service free of charge – but here’s a catch – in exchange the Hall of Famers agree never to play on Barona’s tables! To conclude, the Blackjack Hall of Fame is fairly new, but it will be interesting to see its membership grow in years to come.